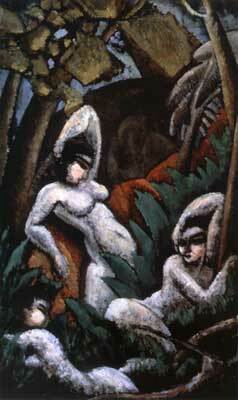 Born in Bialystock, Max Weber came to New York in 1891. He attended Pratt Institute in the city, and went back to Europe to study at the Julian Academy in Paris with Matisse. During these war years, he was part and parcel in the movement of the European Avant Garde to New York. In 1930, there was a retrospective of his work at the Museum of Modern Art.